يشكل فندق أوت باك بايونير لودج بموقعه الممتاز في منطقة سياحة, ثقافة ضمن مدينة ألورو، مكاناً ملائماً لقضاء العطلة بعيداً عن عجقة أيام العمل. يمكن من هنا للضيوف الاستمتاع بسهولة الوصول إلى كل ما تقدمه هذه المدينة النابضة بالحياة. بالنسبة لمن يريد الخروج، هذه بعض المعالم السياحية المتوفرة للزوار نايت سكي شو, تر & انفورماسيون سنتر, ايرس روك ريسورت كامب­ جروند. كما يقدم أوت باك بايونير لودج الكثير من الخدمات لإغناء رحلتك في ألورو. يمكن لضيوف الفندق الاستمتاع بالميزات التالية على أرض الفندق: خدمة الغرف على مدار الساعة, خدمة التنظيف يوميًا, مدفأة, متجر هدايا/تذكارات, خدمة حجز التذاكر . تنعكس أجواء أوت باك بايونير لودج في غرف الضيوف.اتصال لاسلكي بالإنترنت, غرف لغير المدخنين, مكيف هواء, تدفئة, اتصال محلي بشبكة الإنترنت (تطبق الرسوم) هي بعض الميزات الموجود في العديد من الغرف. يمكنك طلب اللائحة الكاملة للخدمات في الفندق ومن بينها مركز للياقة البدنية, حمام سباحة خارجي, ملعب تنس. مهما كانت دواعي سفرك فإن أوت باك بايونير لودج هو خيار ممتاز لإقامتك في ألورو. We stayed in the dorms and the walk to the bathroom was quite far. Food is pretty expensive in the restaurant and they don’t allow using the bbq for store bought items. Only for the expensive things they sell. WiFi cost extra and not cheap. Checked in around 10:00 but the cabin wasn’t available. We checked our luggage with the porter. The receptionist said we had to pay $5.00 for the use of the internet since we didn’t have a room. I thought this was a little odd. We then went on a 8 hour tour. When we returned, we had to carry our luggage to our cabin. Lights marking the signage & paths at night was very dim or non existent. Had difficulty locating our cabin at night. Spoke with the manager in the morning & he refunded my $5 for the internet. I liked the managers quick action. This accomodation suited us perfectly. Two of us shared a room for potentially four guests. It was perfect for two, but would have been a tad crowded for four. Having a bathroom was the clincher, as sharing facilities would not have suited us at all. Thank you to the staff for finding a room that suited. I stayed in the hostel (lodge). The whole complex was very clean and tidy. Staff were always using spray to keep bugs at a minimum. They have a guest kitchen where you can buy your food from the local supermarket and cook your meals. The restaurants were quite expensive but with the option of cooking for yourself it made the stay worthwhile. Highly recommended. Stayed at this place for 2 nights. There is nothing wrong with it - friendly staff, clean and nicely air conditioned rooms, nice common areas, swimming pool, location in the centre of Ayers Rock, plenty of free parking spaces - but it is a huge hostel and that makes it quite unpersonal. I prefer smaller ones. But if you are on a budget, this is really the only option in Ayers Rock. 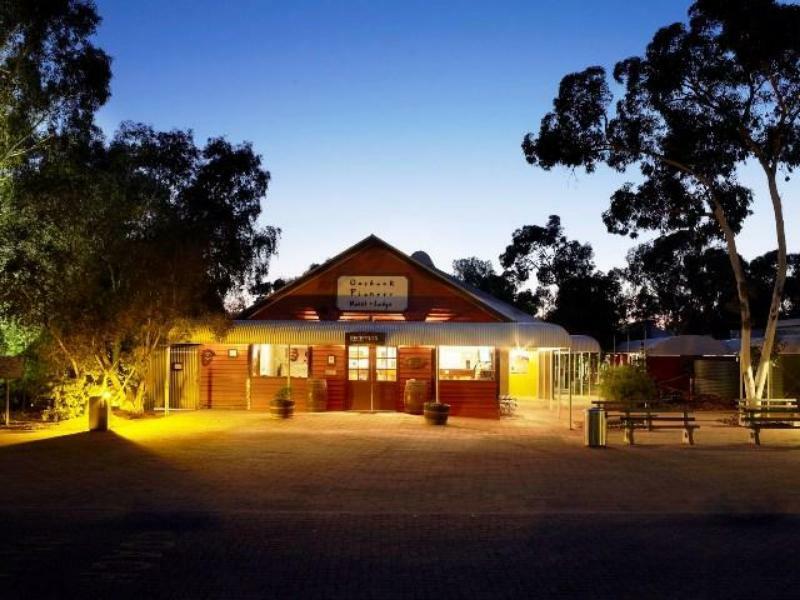 Great hostel and place to stay in Yulara, which only has an expensive selection of hotels. The 4-bed mixed dorm I stayed in was more comfortable than I'd expected; thankfully airconditioned. I really appreciated the free airport transfers and shuttle bus around Yulara. All the staff at the Ayers Rock Resort town were very helpful and friendly. Our accommodation at the Outback Pioneer Lodge was in a pleasant room with much needed air conditioning. 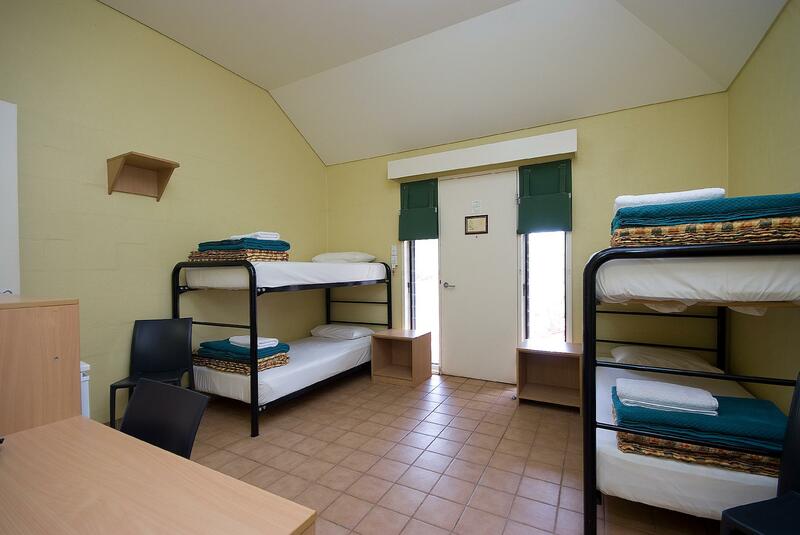 Accommodation at Uluru is expensive and we found that this was an affordable way of doing it. The downside was that there were no private facilities in the room. The staff and facilities were really good but it is very expensive because of the location. A comparable room somewhere else would be less than half the price we paid, this is sad because people can't usually afford to stay longer. Outback Pioneer Hotel was the perfect choice for our family. The rooms are all private chalets and completely soundproof. There’s a restaurant and bar for food and a free shuttle bus that brings you around to the other resorts. The staff were so helpful advising us to hire a car as there were 5 of us (it worked out much cheaper than tours or hop on hop off bus). The room was cleaned daily and towels were replaced. The air con was excellent and WiFi worked quite well. There was good choice of channels on tv and good entertainment in the bar each night. The pool is much nicer than we expected. Overall I would highly recommend this accommodation for your trip to Uluru! Love the resort vibrancy. Restaurants are nearby. Comfy and welcoming. All accommodation at Yulara is expensive. As a 'budget' option this was good. Rooms were spacious and ablution block had plenty of capacity and was well looked after. Understand that this facility is more like a permanent camp site with stone cabins. Friendly staff, buildings, showers, eating areas, and walkways are clean. Helpful staff. Free shuttle service within the village and to/from airport. Great location. Reasonable price through Agoda. My wife and I shared double. But if you’re with friends or by yourself and love a camp atmosphere, single bunks in the dorms are perfect. The layout is okay, with reasonably comfortable beds and a nice restroom complex with well-equipped showers. The 24-hour kitchen and pool are also nice. My biggest complaint was the amount of cigarette smoke. Smokers smoke everywhere, even though they're supposed to stay in the smoking area, which is for some reason located in the center of the campus. While I was swimming, people kept lighting up beside the pool. It was annoying, to say the least. Great place to stay at Yulara. Lovely pool area, 3 different eating options from shop and cook yourself in the communal kitchen, to buy steak at the BBQ area, cook it yourself and help yourself to a well stocked salad and vegetable bar, to more upmarket and expensive fare. Also it has the only bottle shop in town. Handy! Good accommodation with great staff. They are all friendly and helpful. Tristan has exceptional customer service; he checked in and out with a great kindness and attitude. Common kitchen/area is tidy and it is cleaned every day. The hotel has a lookout point to Uluru itself so it is convenient for sunrise and sunset viewing. 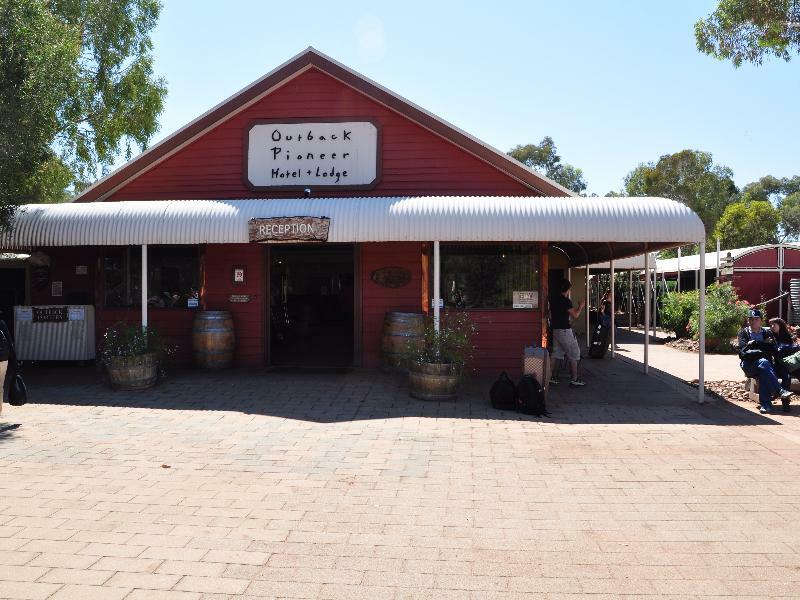 We spent three nights at the Outback Pioneer Lodge. The staff were friendly throughout our stay, from the time we checked in, at the restaurant and bar, and at checkout. We ate at the Bough restaurant, which served very good food at quite reasonable prices, and had a delicious pizza from the bar food area. Our room was larger than we had expected, very clean and quiet (get a room away from the bar area if you can). All up, a very memorable stay. If we return to Yulara we would definitely stay there again. We were looking for a "normal" motel type accommodation, but a private room with no bathroom was the best we could get. We needn't have worried. The room was basic, but clean, air-conditioned and with a TV. The shared facilities (bathroom, kitchen etc) were excellent, well maintained and very clean. The on-site restaurant was OK, but there are also options to use a shared kitchen or BBQ. Staff very friendly and helpful. Well located with shuttle bus to "town". Only negative was the long queue for check-in, and the late availability of our room (3:00pm as advertised, but not the best start when you fly-in in the morning, its hot, and you just want to dump your stuff and chill).